← A Peep-show for 20 cents? I know just the place! Following last night’s airing of the show as the finale of the current series, I can finally reveal a secret I’ve been bursting to tell you! 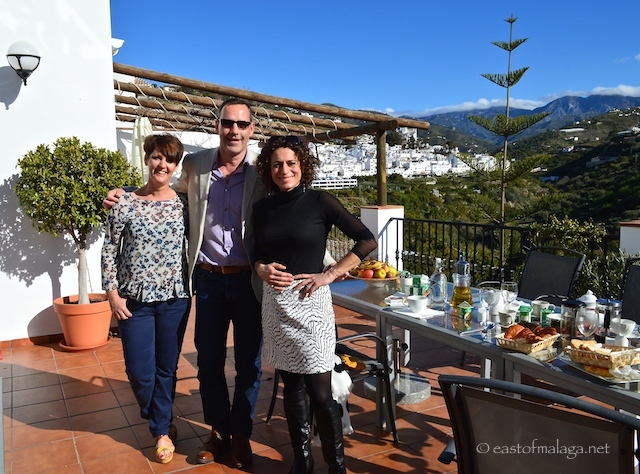 Alex Polizzi, also known as “The Hotel Inspector” came calling, east of Malaga and, as someone who knows the area well, I was offered an opportunity to work with her. The Hotel Inspector is a UK documentary television series featuring hotelier and business-woman, Alex Polizzi, in her quest to turn flagging hotels into profitable ventures. The programme usually features some of Britain’s worst-run hotels and bed-and-breakfast establishments, whose owners appear to have no idea how to run a hotel. So why, you might ask, would the Hotel Inspector come calling in southern Spain? Main square in Torrox with the church, behind. The background to this particular episode evolves over several years and focuses on two British sisters who, from 2005 to 2008, transformed a dilapidated building in the charming town of Torrox in the foothills of the Sierra Almijara and Tejeda mountains, into a stylish 8-bedroomed boutique hotel. On the face of it, whether you love mountains, beaches, the hustle and bustle of the big city or the peace and tranquility of a white-washed Andalucían town, this hotel has it all. With spectacular views of the mountains, proximity to blue-flag beaches, many interesting places to visit nearby, being only a 40 minute drive from Malaga’s vibrant city and airport and, to cap it all, the town of Torrox is officially recognised at having the best climate in Europe. Jacaranda blossom behind the figure of “El Miguero” in the main square, Torrox pueblo. However, soon after the doors of La Casa hotel opened to guests in 2008, the global economic downturn took hold, resulting in a fall in tourism and leaving the sisters struggling financially. Despite working long hours, the situation has changed little in the intervening years, with occupancy rates still low. The cast of characters in this particular three-act drama includes British-expat sisters, Sarah Melton and Karen Atkinson, (with a quiet, behind-the-scenes role played by Sarah’s husband, Neil); Hotel Inspector Alex Polizzi; various international journalists and bloggers from such publications as Condé Nast and The Telegraph; Andalucía-based luxury travel writer, Andrew Forbes …. oh, and Yours Truly! ACT ONE involved one of the sisters getting in touch with the show after seeing an advert in a local English language newspaper on the lookout for expat hoteliers. 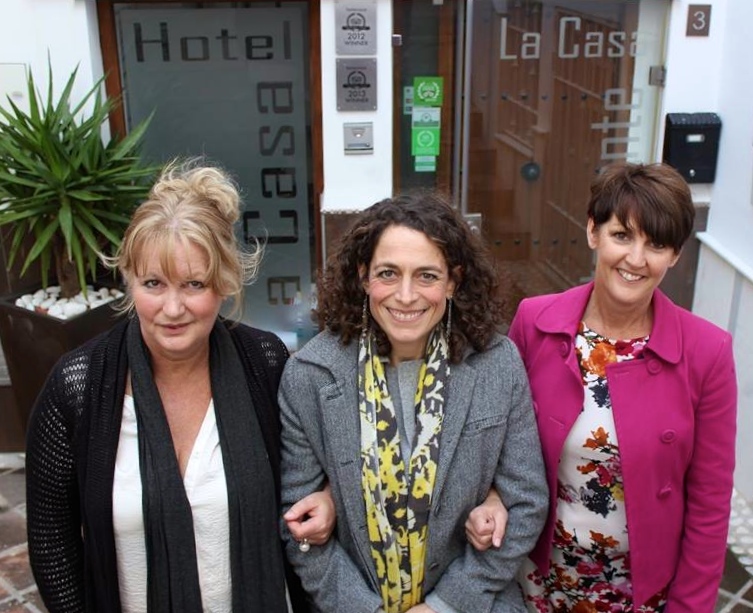 After being chosen to feature in the programme, the hotel was visited by Alex Polizzi together with a camera crew, to make her assessment of how to transform the hotel’s fortunes. 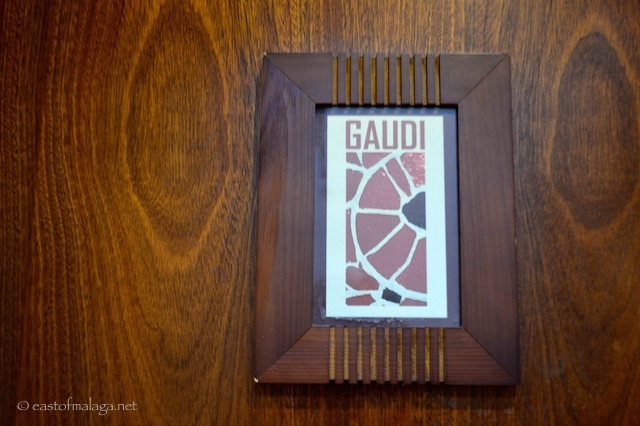 It soon became apparent that La Casa was not the usual type of establishment featured on The Hotel Inspector and, in this particular case, the problem appeared to be the marketing and branding of the hotel (and the local area), rather than its service and quality. ACT TWO began towards the end of March 2015 and featured the return of Ms Polizzi and her camera crew, together with a string of travel writers, in an attempt to market the area to them. At the same time, the hotel was being rebranded with the launch of a new website, logo and promotional literature, plus the main players were interviewed on local radio about La Casa featuring on the Hotel Inspector show. My press pass for the Nerja caves! ACT THREE saw the sisters leading the group of journalists around some of the delights of Torrox village, as well as giving a taste of what this ideal location has to offer today’s more discerning traveller. Our tour began in the main square of the village before moving on to the local Nevaillo olive oil factory where we were given a demonstration of how the oil is produced and bottled. Next, we were whisked back-in-time to the 17th century hamlet of El Acebuchal – known locally as The Lost Village where, after a brief look around, we headed to the local tavern where we were treated to a sumptuous tasting-menu featuring home-made bread, tropical salads, wild boar, venison and chicken. Our final stop of the day was a guided tour of the famous caves in Nerja, discovered by five boys in 1959 and which has now become one of the most visited attractions in Spain. After a brief rest and just enough time for a shower, our evening continued back at La Casa hotel with a delicious A La Carte dinner. The menu was extensive with a choice to suit all tastes including antipasto, prawns pil-pil, pork with mushrooms, oven-baked cod and lamb shanks followed by such delights as “icky-sticky pudding” and platters of Spanish cheeses and hams. Everywhere we went, we were filmed! Of course, every step of the way, we were filmed and interviewed about what we had seen and experienced. At first this proved rather daunting, but it was amazing how quickly you got used to having a fluffy sound microphone hovering over your head and/or having a camera crew nearby. It was an absolute delight working with Alex Polizzi who is a lovely lady and comes across just as naturally as she does on TV. She is outgoing, very friendly and willing to pose for endless photos or exchange a few words with people who recognised her from the show. La Casa hotel features seven individually designed double/twin rooms (mine was named Gaudi, after the famous Spanish architect) and a spacious suite with a private terrace. The en-suite rooms are comfortable and spotlessly clean with A/C for cooling or warmth, whatever the season. There is a beautiful sun terrace with amazing views of the mountains and valley, a bistro restaurant serving delicious food and, rave reviews from people who have stayed have earned this #1 rated hotel in Torrox a Travellers’ Award on TripAdvisor for the past four years. From 5th June, the hotel’s restaurant (also used by many people not staying as guests) will be moving to a new venue in the main square of Torrox, so if you are in the village, I’d certainly recommend a visit. Karen and Sarah are attentive hosts, and whilst I arrived as a guest we parted as friends – testimony of which is obvious by the many people who return to stay at La Casa hotel, year after year. I’d like to take this opportunity to wish Karen, Sarah and Neil all the best with Hotel La Casa and their new venture – the restaurant which will open shortly in Torrox village. Disclaimer: Whilst I stayed at the hotel as a guest of La Casa Hotel/Twofour Productions, I was not asked to write any reviews or recommendations in return. Any views expressed here are my own, and I am happy to do so because I enjoyed my stay and would genuinely recommend a visit to the hotel or restaurant. 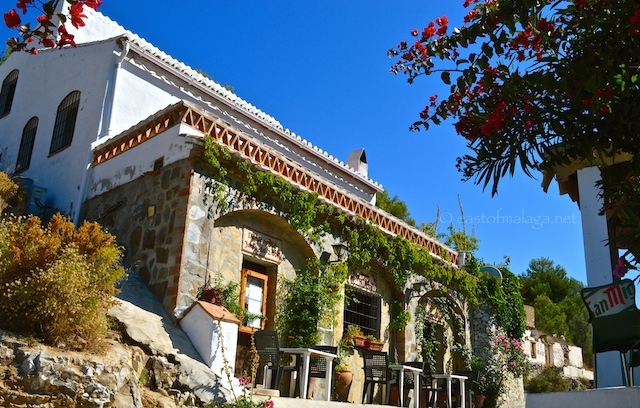 Come and visit La Axarquía, east of Málaga – it’s the AUTHENTIC Spain you’ve been looking for! This entry was tagged Andalucía, East of Malaga, Europe, Food, life, lifestyle, Malaga, Nerja, Spain, Torrox, travel. Bookmark the permalink. I read this and then watched it on catch up, now we will be staying there for a couple of nights week after next, it looks so nice. We are doing a tour Conil de la Frontera to Torrox for a couple of weeks, deciding on which area we will move to next year after I retire in March. Hey that’s great, Roy! Glad you managed to book in at La Casa – I think you’ll enjoy your stay very much 🙂 Thanks for your kind words! I’ve never heard of this programme although that’s to be expected, I guess – I’ve never lived in Britain haha! But even here in Spain they have similar types of shows and I never watch them, because I never watch TV. I’m SO happy they got lots of bookings as a result of the show! Looked like so much fun to participate in the show! Stunning view from the hotel…wow!!! 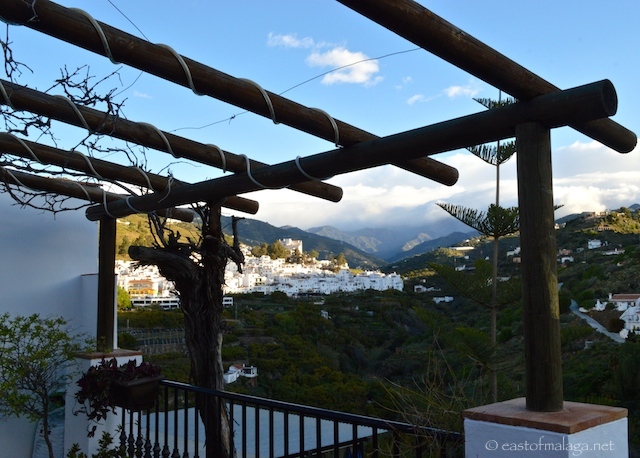 All good here – enjoying some Andalucian life for a few weeks! I went onto the hotel website – it looks great! Sounds like a wonderful time was had by all. I’m delighted too hear Ms Polizzi is as natural as she appears on TV. So where was your picture on the terrace then? I hope the new restaurant is a great hit and that bookings soar after the airing of the programme. I did think about posting that photo, David – but Andrew is so much more photogenic than me! LOL! Yes, Alex is absolutely lovely – WYSIWYG 🙂 Truly hope Hotel La Casa (and their new restaurant) do well – they deserve it!